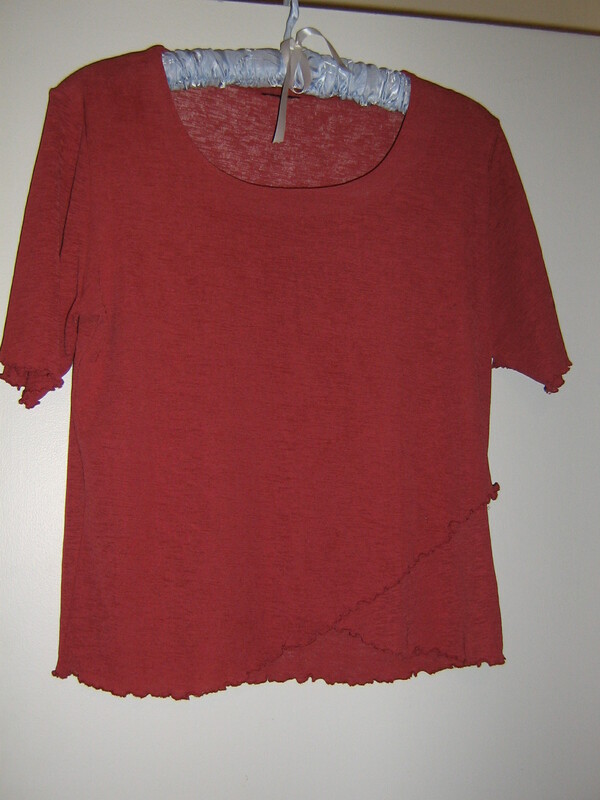 I started looking for reconstructed and upcycled clothing on the net, and never dreamed how many hits I’d get. So many people are recycling clothing into all sorts of new fashions, and most of them are way more innovative than I would be. 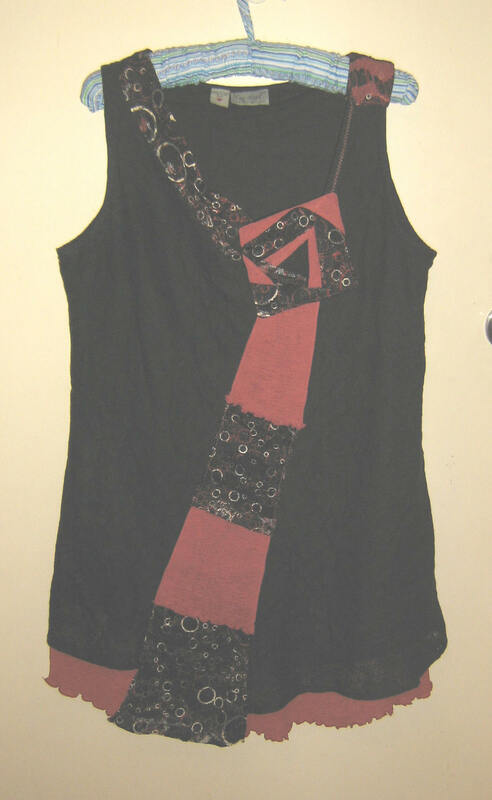 Try Googling reconstructed clothing, or recycled clothing, and you will find all sorts of inspiration. There are things to buy from other people, and ideas for things to make yourself. I wanted a new outfit to wear to the editing workshop, and decided to create one myself out of op shop clothing. I’ve shopped op shops for years, first out of necessity when money was very tight, and more recently from not wanting to be a conspicuous consumer. It doesn’t hurt that it can still be way cheaper! I went op shopping, and challenged myself to find what I needed in just one shop. 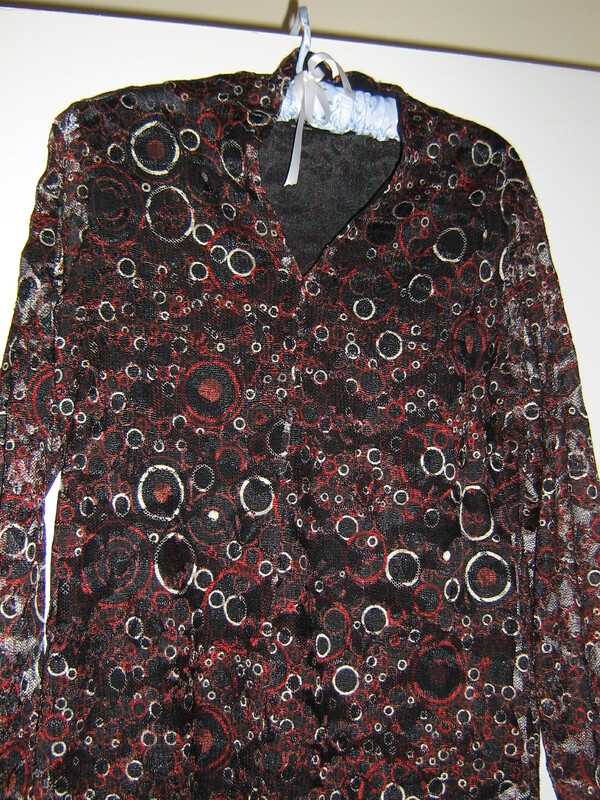 Eventually I came away with one black top, one patterned, and one plain which picks up the colours of the pattern. I feel I ought to call the colour apricot, or salmon, but really I guess it’s orange! These are the tops. The black one is going to be the base, I’m able to get into it but it’s a little tight, so I plan to cut it apart, and use the other two tops as decorative ways to put it back together again. 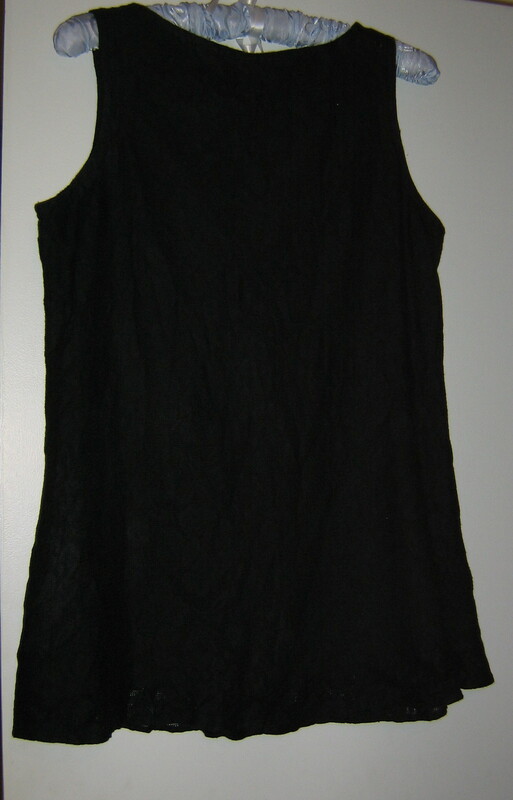 Also I’ll lower the neck a bit, so I can wear another plain top underneath it, with sleeves for warmth. I really like some of the upmarket fashion labels I’ve seen in stores, with asymmetric clothes, and each garment having three or four different fabrics in it. Like these at TS14Plus clothes, and these Koos van den Akker designs from the Vogue pattern catalogue. I also did an image search on Google for Koos van den Akker, and came up with lots of ideas, although the flamboyance quotient of most of them is too high for me. Browsing through the images led me to several blogs of other admirers of his work, and eventually to the book, Couture Collage, which I am teetering on the brink of buying. I’m hoping to end up with something inspired by these images, without the price tag. My base garments cost me $11.50 altogether. I started by cutting down the front of the black top, on a diagonal line. Then I cut a strip of the pattern fabric to finish the raw edge at the neck. 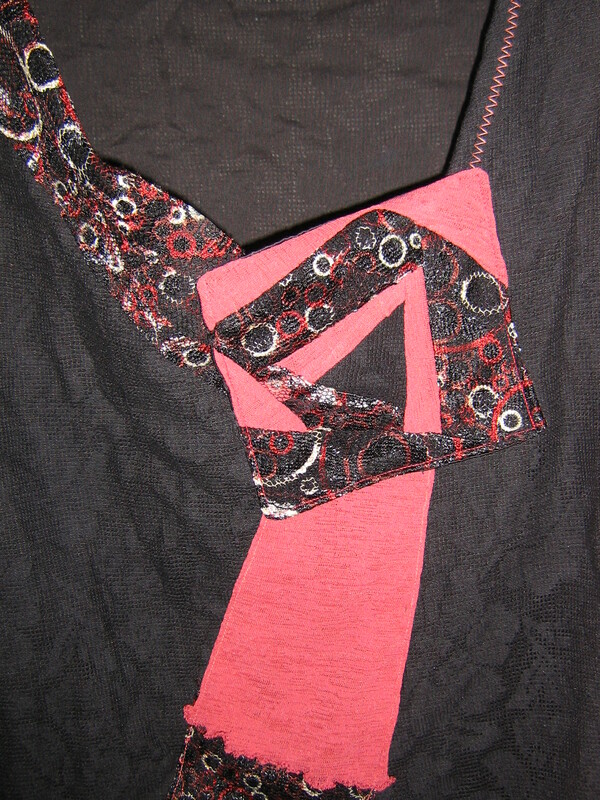 I cut pieces of both fabrics and pieced them together to fill the gap between the two edges of the black top. Next step was to try it on, and I found that I had cut a little too far, and the V of the neckline was a bit low. I needed to construct something to put in to fill the space. As often happens, inspiration came from nowhere in particular, or more accurately from one of my quilting books which was lying on the table. I decided to make a small patchwork square to stitch over the gap. I made a kind of uneven log cabin block, starting with a triangle instead of a square, but cut the finished block to a square, so it is completely asymmetrical. The finished square was a bit unruly in terms of having nice straight edges and corners, so I stitched it right sides together with a scrap of black lining, then turned it right side out. I think the technique is called ‘bagging out’ in the trade. This little exercise highlighted how much easier it would be to do this kind of garment construction with a dress form. I’ve never had one, and never really felt the need, but when you are making the garment up as you go along I think it would be really useful to have something to put it on so you could see how it was shaping up, literally. I shall have to look out for a second hand one, as they are pretty expensive new. I know there are ways of making your own custom fit, but I don’t feel like investing the time at the moment, and mostly I’m not looking for a perfect fit in these garments. Having fixed up the neckline I had only to stitch the lower part of the orange top around to the lining of the base black top. The orange top already had a nice lettuce edge on it, and because it was a wrap style with two layers at the front there was enough of the edge to go all the way around the hem of the black top. A bit of finishing off, and done, albeit at 7.30 on the morning of the workshop! I was pleased with it. When I came home, however, the blonde dog was so pleased to see me that she jumped up and caught one of her claws in the slightly lacy black fabric, and made a hole in it. Next time I wear the top it will have either a contrast patch, or possibly a pocket added to it! It’s also occurred to me that maybe I should create some printed or woven labels to sew into my own constructions – another side project. If I’m going to keep posting pictures I need to make an effort to take better ones too.